NEW ZEALAND – Going to New Zealand in September was a bit of a crapshoot. Sure, it's New Zealand, gorgeous any time of year, but early spring weather is iffy at best. You can end up with rain, sleet, and lots of cold and wind in between. Or you can get lucky with mild days, cool nights, and lots of sunshine. Given that September is still low season, we were happy to take our chances with the weather and take advantage of the cheap airfare and hotel discounts. Neither my husband nor I are into adventure activities: bungee-jumping, sky-diving, kayaking, and glacier-trekking were not on our wish lists. What we did want to do was lots of eating and drinking, with plenty of walking and biking mixed in, a task easily accomplished in New Zealand regardless of the weather. We flew into Auckland on the North Island and crashed for a night at The Langham Hotel, a grand old, recently remodeled hotel downtown. I booked a hot stone massage at their Asian-inspired Chaun spa — desperately needed after the 13-hour flight from LA — then soaked outside in the hot tub. We summoned the energy to wander around hippie-chic Ponsonby Road and stopped for pasta and wood-fired pizzas at GPK. We walked down to the harbor after lunch to check out the impressive assortment of sailboats and yachts. At this point, we definitely needed a nap, so we taxi'd back to the hotel to rest before a night out on the town. Or not. We had scored reservations at dine by Peter Gordon, an award-winning restaurant by one of NZ’s top chefs. Too bad we slept through our alarm and our dinner reservation. The food and the views of the city are supposed to be amazing. Maybe next time. We slept in the next day and made our way to Waiheke Island, 35 minutes away by ferry. 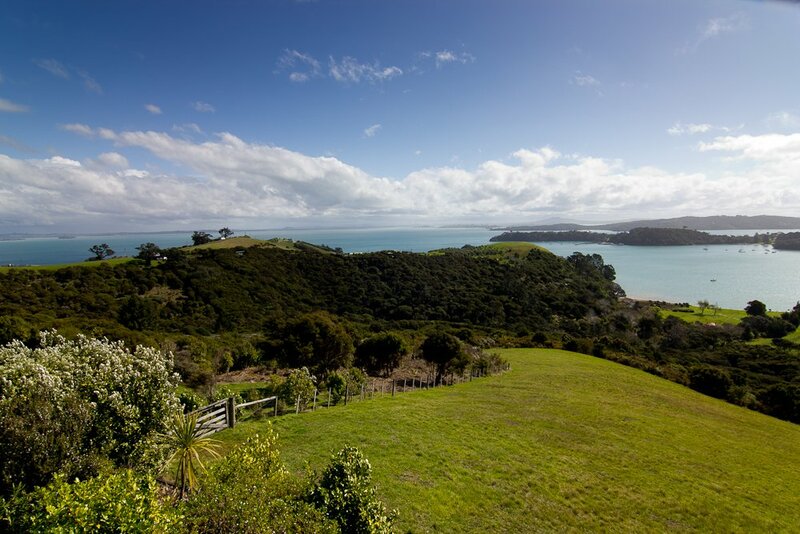 Dotted with vineyards, olive groves, and small farms selling homemade honey, fresh goat cheese, and alpaca sweaters, Waiheke might just be heaven on earth. (The windy ferry ride alone is worth the trip: Be sure to sit on top.) The island's robust red wines and spicy green olive oil bring to mind a mini-Tuscany — only with beaches. We stayed at the cozy, four-bedroom Te Whau Lodge. Gene O'Neill and Liz Eglinton are phenomenal hosts and fantastic cooks — and they have the best view on the island from their back terrace. Local wine and homemade nibbles are served every evening at 7 — by the fire in cool weather or on the terrace if it’s nice out. For an additional fee, Gene will prepare you a two-course dinner afterwards. We enjoyed our first meal so much, we decided to eat all our meals at the Lodge. We couldn’t imagine finding anything better anywhere else. This place is so relaxing; Liz and Gene are so nice — what incentive did we have to move? One rainy afternoon when we were relaxing and reading in the cushy, pillow-strewn window seat overlooking the bay, Liz brought us freshly baked cookies and hot tea. Sigh. Another afternoon, Gene, who had figured out that we were foodies, asked if we wanted to go into town to shop for dinner with him. I went along and got to check out the local bakery, fish shop, cheese shop, butcher, produce stand, and grocery store. Of course Gene knew everyone. I could go on and on. If you feel like venturing outside the Lodge, they recommended a leisurely lunch down the road at Te Whau Winery (no relation to the Lodge), where the much-lauded restaurant has 360-degree views of the bay and Auckland's skyline and an extensive Kiwi wine list. We stayed on Weiheke Island for two days. Our only regret was not staying longer. For a taste of New Zealand's indigenous fare, you can detour south to Rotorua, in the center of the North Island. You'll need to ferry back to Auckland, then drive (about 3½ hours) or fly (a 40-minute flight) to Rotorua. Known for its hot springs, the area is also a hub of Maori culture and is the best place to experience a traditional hangi feast, a meal in which all the food is cooked underground using hot stones. Charismatic chef Charles Royal offers outdoor Maori food tours, on which guests scavenge for wild herbs and vegetables and learn to cook traditional dishes like broiled tiiti (muttonbird) with piko piko (an edible fiddlehead fern). Next on the itinerary: Nelson, at the very north of the South Island. From Rotorua, you can drive to Wellington (at the tip of the South Island), if you have time for a meandering six-hour journey, then ferry to Nelson. Otherwise, fly from Rotorua to Wellington (about an hour), then take a puddle jumper (35 minutes) to Nelson. We saved time by flying, then rented a car for the incredible drive along the coast from Nelson into Bleinheim, inland to Marlborough, then on to Kaikoura on the East Coast. The scenery was beyond stunning. Laid-back Nelson is apparently one of the sunniest spots in New Zealand. Unfortunately, it rained for us. We stayed at Wakefield Quay House, a charming B&B run by a quirky and fun-loving couple, Johnny from NZ and Woodi from the UK. They’re great hosts and a wealth of information about the area — and Woodi makes a mean egg scramble for breakfast. Their rambling Victorian sits on a busy road in front of the water (light sleepers, you've been warned), and the views from both bedrooms are phenomenal. We stayed in The Crow’s Nest, which has a private balcony overlooking the water and a glassed-in bathroom — a “loo with a view.” We had a lovely dinner on the water down the road at Boat Shed: The Te Matuku Bay oysters and half crayfish with fennel, lemon, and chili oil were out of this world. Johnny runs a sailing school and, despite the cold, took us out on his sailboat for a half-day. It was gorgeous: snow-covered mountains in the distance, brief hints of blue sky. I can only imagine how nice it would have been on a warm day. We continued by car down to Marlborough, the largest wine region in New Zealand. Known for its zippy sauvignon blancs, Marlborough actually generates many more wine varieties than are currently exported to the U.S. Its cool climate is perfect for pinot noirs and Rieslings, but we also discovered several lovely methode traditionelle sparkling wines. Explore Marlborough offers great personalized food, wine, and bike tours, with half- and full-day options. Activities include private tastings at boutique vineyards, exploring the Marlborough farmer's market, and cheese-making classes with artisanal producers. We did a full-day (9 a.m. to 3 p.m.) bike and wine-tasting trip — a great way to get off the beaten path and explore the area. Our guides were fantastic. We learned a lot and had a great time — even though it started pouring halfway through the tour. Did we push on? No. They arranged a van so we didn't have to bike in the rain. Bless them. On to Kaikoura for its stunning mountains-meet-ocean scenery and whale watching. We stayed on a sheep farm at a tiny B&B called The Point. I say "tiny" because it’s literally a guest room in someone’s house. Definitely no-frills (breakfast consisted of toast and cereal), but it was really affordable and had some of the most spectacular views I have ever seen. Since it was early spring (a.k.a. prime lambing season), we got to hold a baby lamb and feed it a bottle. This was one of the highlights of the trip, even if I've had a hard time eating lamb since. Highlights of Kaikoura: an incredible short (or long, depending how much time you have) ocean-side hike accessible from the car park a five-minute walk from The Point. The trail is well marked and winds up some stairs onto a big green pasture where cows graze peacefully, with the ocean and snow-covered mountains in the distance. It’s seriously awe-inspiring. Had we been organized, we would have packed a picnic lunch and made a day of it, but we were trying to cover lots of ground before a late-afternoon flight from Christchurch to Queenstown. The baby seal colony 20 minutes north of Kaikoura is incredible. It’s unmarked, except for a small sign in a little parking lot off the highway. You have to hike about ten minutes into the woods to get to a pool of water with a large cascading waterfall and — voilà — 50 or so seal pups frolicking in the water! No admission, no fences, no ropes. Just a sign asking that you not feed the seals. After snapping lots of photos, we hiked back to our car and stopped down the road at another oceanside parking lot where a little crayfish stand with a chalkboard menu and a few picnic tables made a perfect roadside lunch: whole or half crayfish, steamed, wrapped in newspaper, and served with various sauces. That’s it — I don’t even think they served chips. Maybe water or beer. It was by far the best lobster I’ve ever had in my life. We continued the drive two-and-a-half hours south to Christchurch (again, through phenomenal scenery) and nearly missed our flight to Queenstown. Luckily, in New Zealand you don’t have to arrive to the airport an hour before your flight. Situated at the foot of the Southern Alps, Queenstown is best known for its stunning scenery (no, it doesn't start to get boring) and adventure activities. It is, after all, the home of bungee-jumping. Queenstown is also close to popular nature areas such as Milford Sound and Fjordland National Park, so it makes a great home base for adventurers. We stayed at The Rees, a fairly new eco-lodge on Lake Wakatipu overlooking The Remarkables mountains range (yes, that's the real name). Our incredibly spacious room not only had a wall of windows in the bedroom overlooking the lake and the mountains, but a wall of windows in the bathroom, too. A sunset soak in the Jacuzzi with a glass of wine became a nightly ritual. For such an outdoorsy town, Queenstown has many cosmopolitan restaurant offerings. True South, the hotel's restaurant, has gorgeous lake views and a ten-course, all-local tasting menu. It also serves a fantastic breakfast which is included in the room rate. The Bunker is, quite literally, a hidden culinary gem specializing in wild game. You'll find it behind a big old wooden unmarked door on a little side alley. Gantley’s, surrounded by landscaped gardens just outside town, has an award-winning wine list with over 250 labels, including New Zealand’s top vintages. We worked our way through an impressive number of them. We had a lot to celebrate.